With our archival matte photo papers details are king. Free of surface texture or reflections, every detail you worked so hard to capture will be beautifully displayed. Try matte papers for landscapes, still life, architecture, graphic design, and so much more. Even though matte papers provide amazing detail and color reproduction,they cost 40-60% less than photobase glossy or satin inkjet media. A great value indeed. These are the top quality matte papers on the market today. The heaviest, highest quality photo matte available today. A 4-ply mat board with Polar Matte on top. These papers match the quality you'll find from big retail brands for less. A high-performance photo matte paper with an elegant linen texture. For photos, giclee prints, greeting cards, and more. 60lb. Paper Canvas offers the texture of canvas media and the flexible use of a paper stock. 50lb. Premium Matte Double-sided has a smooth, bright white finish that is photo inkjet printable on both sides. The lightest paper in the Premium Matte family, this matte photo paper offers printing flexibility and cost savings when you demand top grade image reproduction. The lightest double-sided matte photo paper we offer, this paper offers printing flexibility and cost savings when you demand top grade image reproduction. 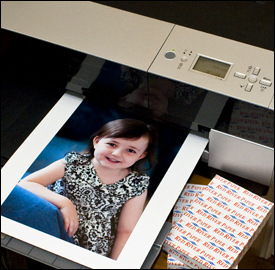 This light-weight photo matte paper will surprise you with its ability to print brilliant color and detail to equal Epson's 26lb. Photo Quality InkJet Paper. While writing my latest book, "Photoshop Studio with Bert Monroy: Digital Painting" , it was crucial to see how colors worked together on a spread. Proofing each spread on Red River Premium Matte papers was vital to the success of the book.